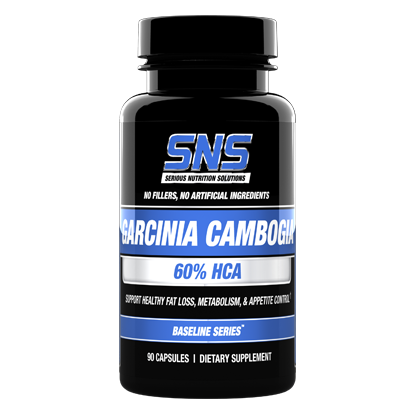 SNS Garcinia Cambogia 60% HCA is a stimulant free, jitter free, dual mode fat loss agent that can be taken to help suppress appetite and increase fat burning and metabolism. Are you a midnight snacker? Does the thought of dieting make you crave food? If you answered yes to any of those questions, SNS Garcinia Cambogia 60% HCA may be right for you. What is Garcinia Cambogia Extract & Why is a 60% HCA standardization important? Garcinia Cambogia Extract is derived from plants that grow throughout Southeast Asia. The importance of the HCA content is that it is the active ingredient that makes Garcinia Cambogia Extract effective. In simple terms, it’s not the amount of Garcinia Cambogia Extract that you take but the amount of HCA/Hydroxycitric Acid that you take in that helps deliver the powerful benefits of this unique ingredient. SNS Garcinia Cambogia can be stacked with SNS Green Coffee Bean Extract, CLA Xtreme, RK-500 Xtreme or RK-125 (Raspberry Ketones), Lean Edge, or select other SNS products for improved, synergistic results. As a dietary supplement, take 1 to 2 capsules (500 or 1000 mg.) up to three times per day, 30 to 60 minutes prior to meals. This product is intended for healthy adults over 18 years of age. Consult a physician before using this or any dietary supplement. This product should not be used by women that are pregnant or nursing. Do not use if you have any pre-existing condition or are taking any medication without consulting your physician. Store in a cool, dry place. KEEP OUT OF REACH OF CHILDREN.